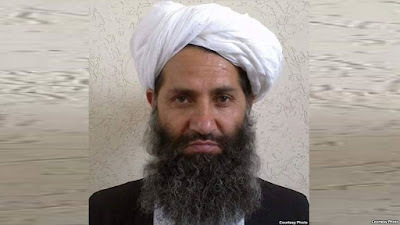 A photo circulated by the Taliban of leader Mawlawi Haibatullah Akhundzada. ISLAMABAD (Reuters) - A delegation approved by the Taliban’s supreme leader visited the Pakistani capital this week for exploratory talks on restarting peace negotiations to end Afghanistan’s 16-year war, two senior officials in the movement said. It was unclear if any progress was made in the unofficial meetings with a representative of a prominent Afghan politician. Many previous attempts have failed to revive direct talks that ended nearly as soon as they started in 2015. The Islamabad talks on Monday followed another back-channel meeting over the weekend in Turkey between individuals with Taliban connections and representatives of Hizb-i-Islami, the party of a former Taliban-allied commander who last year laid down arms to join Afghan politics. A spokesman for Afghan President Ashraf Ghani said on Wednesday he was not aware of the Islamabad talks, while the Taliban did not respond to queries. Both sides on Monday denied participating in the Turkey talks. WNU Editor: This is not the first time that there have been reports of peace talks to end the Afghan war, but what is interesting about this story is that there is a Taliban delegation visiting Pakistan right now .... Three-member Taliban delegation visits Pakistan (Express Tribune). Update: Afghans Say Talks With Taliban Are Underway; Insurgents Deny It (New York Times).